3. Keep wrapping. If you're not bored yet, you're not done. 3. 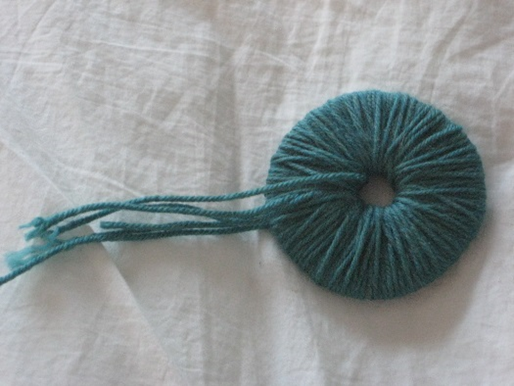 Continue to wrap yarn until you have quite some yarn volume on your cardboard donut, but don’t worry if you need to use multiple pieces of yarn to accomplish this goal; as the essence of the pompom is a bunch of cut-off ends poking out in all directions, you can use as many different cut pieces of yarn as you need for adequate wrapping. 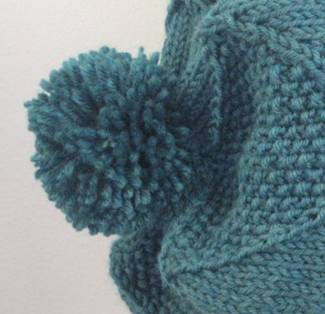 And despite the fact that making a pompom is a pretty annoying venture, you will want to make sure that you have thorough coverage, or your pompom will be scrawny and sad. For perspective, I’ve wrapped mine minimally. 4. The cutting. It will be easier if your scissors are nicer than mine. 4. 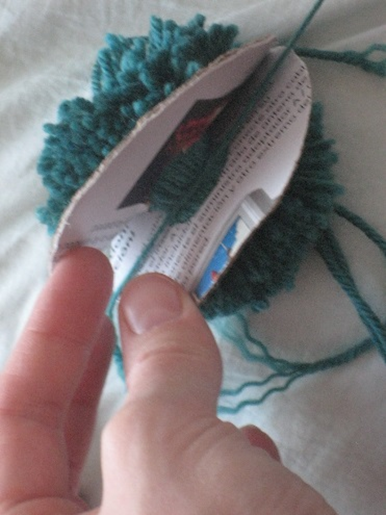 Once wrapping is complete, insert scissors between two cardboard discs, and cut around the entire edge of the pompom. 5. Tie that baby up! 5. 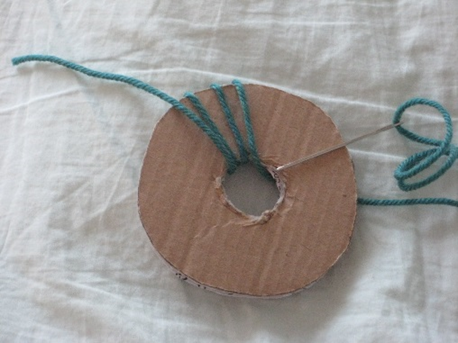 Pull cardboard discs apart slightly, to expose juicy center of yarn. 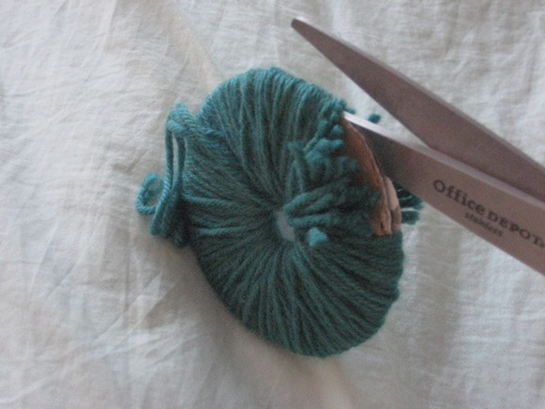 Cut one final piece of yarn (about 18” should do it), and wrap around center, knotting as tightly as you can without breaking anything or cutting off circulation in your fingers. Knot again, if you’re as paranoid as me. 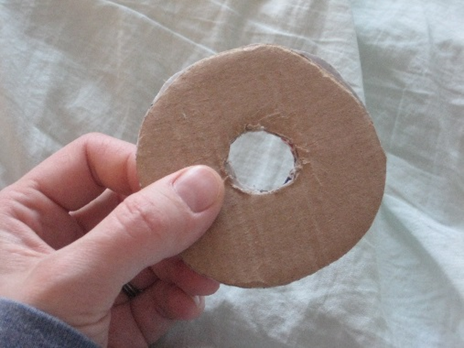 Leaving those two ends long, work cardboard discs off of pompom (you can cut them off, if you like, just try not to cut your pompom ends in the process). 6. Mr. Pompom, trimmed and placed in his natural habitat. 6. Finally, fluff and trim pompom as desired, but leave your two long ends from your tie. These will come in handy when you want to attach your pompom to something. Please note, however; cats do not seem to like to wear these as hats. Go figure!